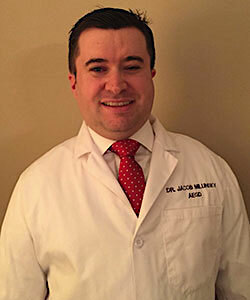 Dr. Jacob Milunsky graduated with honors from Temple University School of Dentistry before attending a prestigious hospital based dental residency at Long Island Jewish Medical Center. He has been in private practice for the past ten years, and is a professor of clinical dentistry at Temple University. Dr. Milunsky also teaches in the hygiene program at Delaware Technical and Community College. Dr. Milunsky is a native of Wilmington, where he lives here with his wife and two young children.